Geneva: The death toll from the worst ever outbreak of Ebola has reached nearly 7400, with just over 19,000 people infected across west Africa, according to the World Health Organisation (WHO). Sierra Leone reported 400 new fatalities this week, bringing the death toll there to 2500. As of December 18, it had the highest number of people infected by the virus – 8800 cases, of which 6900 were confirmed, according to the country’s health ministry. The WHO is attempting to curb an outbreak in the west of the country, where the disease is spreading fastest, by sending a “massive surge of staff and resources” to the area. The UN Secretary General, Ban Ki-moon, who visited an Ebola treatment centre in Sierra Leone last Friday, said the spread of the virus was slowing and that there was reason to be “cautiously optimistic” about ridding the region of the disease. “We have a long way to go. Zero cases in Liberia, and this entire region, must be everyone’s goal,” he said. 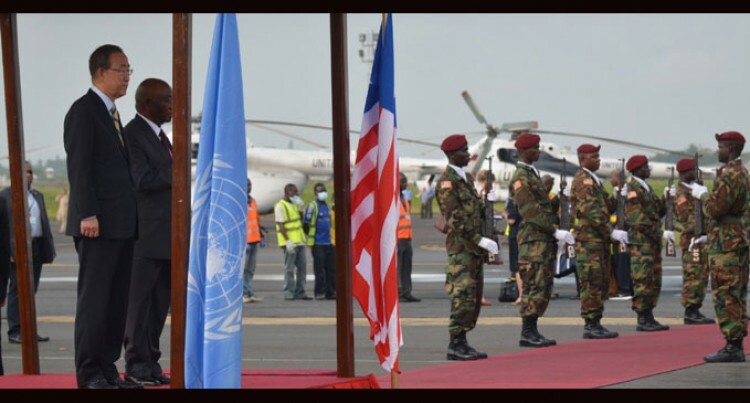 Ban also visited Liberia, which has suffered the most fatalities in the outbreak with more than 3300 victims. The country went ahead with a senate election last Saturday that had originally been scheduled for 14 October and then was twice postponed because of the outbreak. Polling stations opened late in many part of the capital Monrovia and in other cities. The national electoral commission said that all voters would have to wash their hands before entering polling stations and stay at least a metre apart from each other. Ban travelled on to Guinea last Saturday, where the first cases of Ebola were confirmed in March, to meet the country’s president, Alpha Conde. There have been 2453 cases and 1550 deaths in Guinea to date, the WHO said. Ban expressed concern about the situation in the south-east of the country, where the number of infections continues to rise. Both Guinea and Sierra Leone have imposed bans on new year’s eve celebrations such as fireworks displays and beach gatherings in a bid to stop further transmission.